One of the many amazing things about NYC is the number of theatrical productions available to see at any given time. I attend the theater several times each month and still can't keep up. Theater reviews (that inform) are helpful when trying to sort through what to see. However, I should note that theater reviews are subjective and may not always be representative of whether you (yeah you as an individual) will be entertained, moved or inspired by a particular production. As a reference only, here are a few sources for theater reviews in NYC. In Patti LuPone's memoir, she writes that The New York Times theater review is the only one that matters. And I must admit that I always check the NYT review for the shows I've seen, and I will go to see a show that I did not plan to see because it received a good review from the NYT. 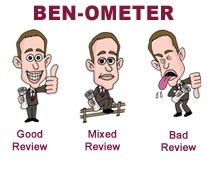 Now, if you don't have time to read the NYT reviews, which by the way is one of the most comprehensive, then you can look quickly at didhelikeit.com to get a visual representation (via the Ben-ometer named after Ben Brantley, Chief Theater Critic for the NYT) of whether a show has received a good bad or mixed review. What is also cool about the site is that it shows the same visual for other publication reviews of the same show so that you can quickly compare reviews. If you are looking for one stop shopping for the major productions on and off Broadway, simply check out Curtain Critic or StageGrade. Curtain Critic reads all the major theater reviews and then assigns a unique numerical score between 0-100 for each review. They even go a bit further for theater aficionados by assigning sub scores to cast, tech (e.g., set, light, sound, etc.) music (if applicable), and book. Then when they are through with that, they assign an overall score and high level review consensus. For the overall score, the publications are weighted; however, they do not disclose the weightings. I would bet that the NYT is probably weighted the most of all the publications. StageGrade also reads the theater reviews and then assigns an old school grade rating to each review and then the overall median grade, which ranges from A+ to (yikes) F-, for all reviews. What is nice about the StageGrade is that they also display a community rating based on user generated reviews and grades and also categorize the shows/grades into buckets such as best reviewed, people's choice and family and under $50. You can go to youtube.com and watch a variety of user generated theater reviews. But, if you are looking for a professional review by a drama critic, then watch Roma Torre's reviews on NY1. Update: You know need a TW subscription to view the reviews. However, you can still read the reviews. If you don't have NY1, then go to their website and watch the review clips, which are roughly 2 minutes long and loaded with useful criticism and scenes from the show. Every major NY publications as well as a few national ones publish theater reviews. See links below for a few examples. Note: Many publications focus on Broadway and the major theaters Off Broadway. If you are looking for the more obscure gems, then you must check out actor magazine Backstage; they provide a variety of reviews for Broadway, Off Broadway, Off Broadway, and Cabarets/Dance. There are slew of websites and blogs which provide user generated reviews. See links below (as well as Blogroll) for a few examples. A special mention has to go to Jesse21 on Talkin Broadway's message board All That Chat. Since Jesse21 publishes his Broadway reviews the day before the show opens, I usually wind up reading his reviews first.